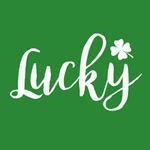 Have some fun this St. Patrick's Day with your Irish loving pal in their Lucky Dog Shirt in Green! The Lucky Dog Shirt will bring out smiles during your outings and this holiday season! This is a fun dog shirt for St. Patrick's day or any day. Tell the world that your dog is your good luck charm with this cheerful dog tank we custom print for you in our BaxterBoo.com t-shirt shop! Whether your dog is lucky because they are a rescue or your dog just naturally brings you luck, this is a great shirt that can be worn year round. It's great on its own or paired with a fun St. Patty's Day dog scrunchie. This sleeveless dog tank also makes a great layering piece for extra warmth on chilly days or for containing shedding. It's so comfortable, even your cat might enjoy wearing this snappy pet tank top! 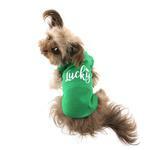 The Lucky Dog Shirt in Green is made of 100% cotton which is sleeveless for an easy fit. This pull-over style shirt has no fussing with buttons or touch fastener. This dog t-shirt features a high-cut, stay-dry belly for ultimate comfort and convenience. This custom design is screen-printed on this soft, lightweight knit. The tank top for dogs is made of 100% cotton. Machine wash cold and dry flat for best results. Great for a gift! LOVE THIS LUCKY SHIRT !!!!!! Posted On 03/14/19 by Darla M from Portland, OR Yes, Darla M recommends this product! I love this shirt !! It fits great...arm holes are very comfortable and shirt is roomy for my large chest ! I am so proud when I wear it on a walk ! People think I am sooooo handsome! My mom likes it as well !! Posted On 03/02/18 by Jennifer L from Senoia, GA Yes, Jennifer L recommends this product! I love these t-shirts and try to get every holiday early. The fit is great and they are comfy! Posted On 04/22/17 by Eunice P from , IL Yes, Eunice P recommends this product! Wish the font was larger to match the larger size shirt and armpits are a bit small for the legs. Material is nice thickness and color exactly as pictured. Posted On 04/19/17 by Donna G from Northport, AL Yes, Donna G recommends this product! Love the shirt and runs small so recommend ordering a size larger. Posted On 03/31/17 by Bonnie W from Warrensburg, MO Yes, Bonnie W recommends this product! 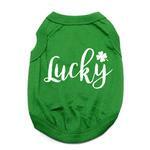 Well made, vibrant green color makes for a beautiful t-shirt for your furry friend. Easy to put on and take off. True to the sizing chart. Lucky is the dog who owns one of these t-shirts! Posted On 03/03/17 by Holly P from Rush, NY Yes, Holly P recommends this product! 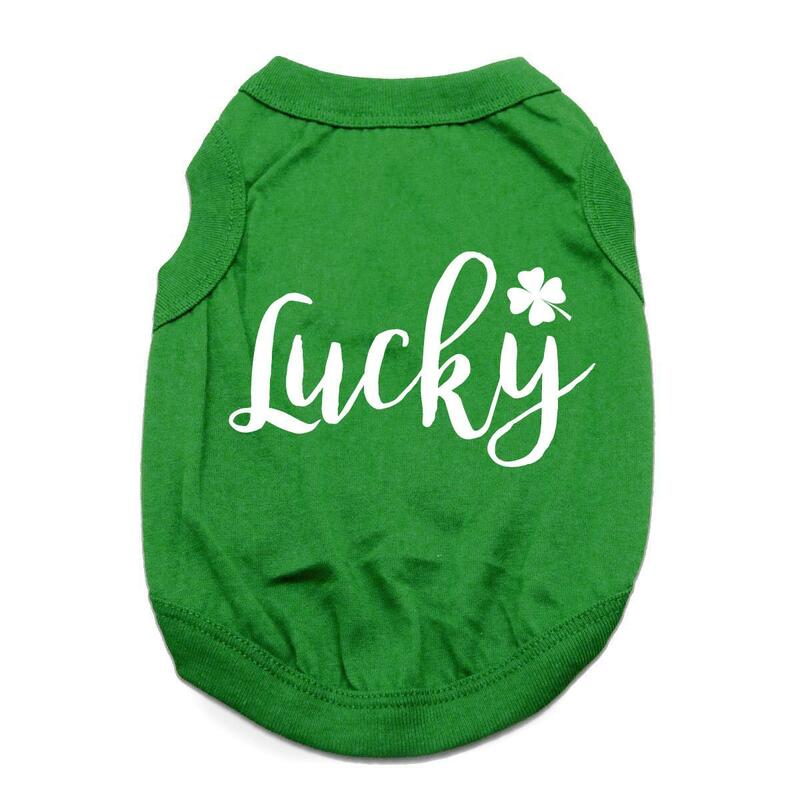 Cant wait for St Patrick's Day, perfect fit for our pup! Posted On 03/01/17 by Ann M from Sun prairie, WI Yes, Ann M recommends this product!